Posted 5/14/2013 11:40am by Judy Lessler. Green Garlic: Green garlic is the garlic before it makes heads with cloves in it. You can eat a lot more of it than the bulb. 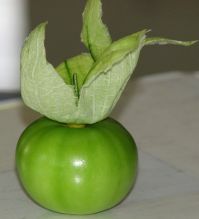 The tough outer greens cannot be eaten; however, the flexible stalk and the bulb are edible. Just slice them like you would a green onion, and go. Below is a picture of the bulb and other parts. You can eat all of the parts on the left of the bulb and the bulb. The leaves on the right are too tough to eat and have been peeled away from the tender stalk.